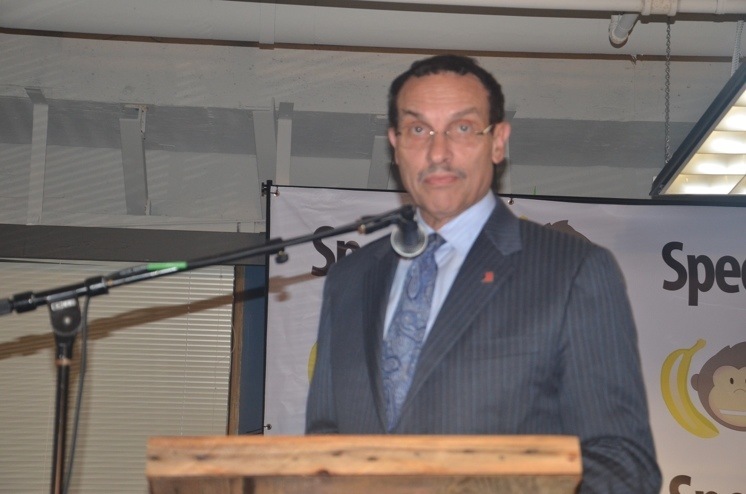 “I think I’ve been here every week since it opened,” DC Mayor Vincent Gray told a standing room only crowd at the Speek launch and thank you party held at 1776DC on Friday evening. Gray and Newark Mayor Cory Booker are two politicians very friendly to startups. Gray and his constituents working on DC’s economic development were instrumental in helping 1776DC secure their prime real estate at 1133 15th Street in Northwest Washington. The center, directed by Donna Harris and Evan Burfield, is the epicenter of startups in DC and the go-to place for some great startup events and parties. “1776 sure knows how to throw a party,” Gray told the audience. “We’ve got it down to a science,” Burfield told us in regards to flipping the space from mega co-working to a great place to party. Walls, desks, and even mock windows are all on wheels which makes the space customizable for anything from hackathons (Angel Hack is being held there this weekend) to small strategy meetings, to parties with upwards of 500. And that’s exactly what happened Friday evening. As for Gray, the very active mayor arrived early and stayed late, making sure to speak with anyone who wanted his attention. Gray, who proudly sported a 1776 DC Tshirt at SXSW earlier this year, was enthusiastic about everything having to do with DC startups. “There were 75 startups knocking at the door when 1776 opened,” Gray told the crowd during his official remarks. Burfield quickly piped up to announce that the final number of startups at launch, a little over a month ago, was actually 103. Gray said that for DC to continue in the right direction they need to reinvent the economy and startups play a big part of that. Gray said that over 600,000 people live in the district and he wants more to live, play, and work in our nation’s capital. Gray was very enthusiastic about Speek, the gamechanging technology that is making conference calls easier. Gray told Nibletz that his job dictates that he’s always on conference calls. In our informal conversation Gray was able to cite details about 1776 and startups (by name) without a crib sheet. Gray also mentioned the dedication of DC entrepreneurs to their companies and their city, laughing about the dedication of Speek’s co-founders and this tattoo stunt from SXSW. As you’ll see in the video, the Mayor of DC is also the Mayor of DCTech and as such, a very enthusiastic cheerleader for all DC startups.